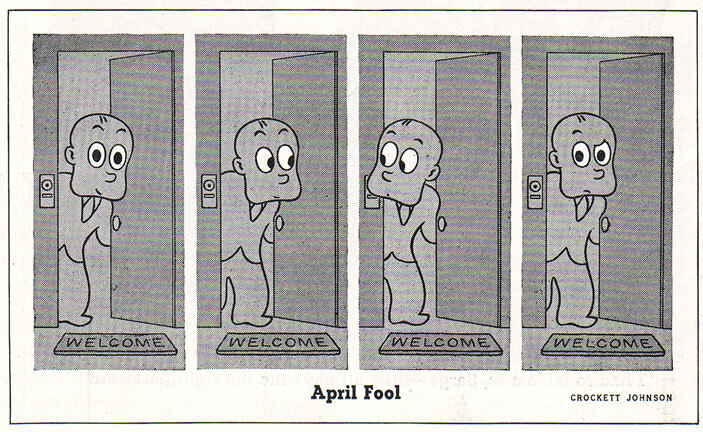 As a follow-up to Saturday’s post (featuring Crockett Johnson’s Little Man with the Eyes strip), here are a few more of Johnson‘s Little Man comics, starting with one for April Fools Day, 1941. I was pleased to see Mark Newgarden share the original post on Facebook because — as I was writing the original post — I was thinking of contemporary cartoonists who would like this strip. 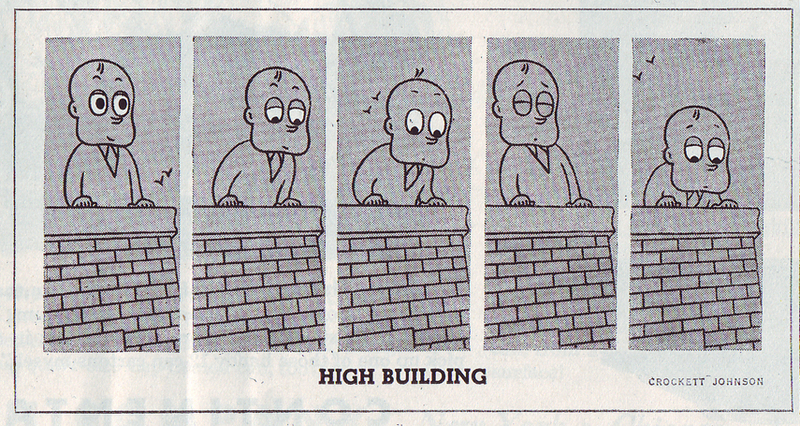 At the top of my list were (and are) Mark, Chris Ware, and Andy Runton. In the above strip, I love how the Little Man’s enjoyment slowly recedes, so that, by the final panel, his face registers concern. Careful readers will also note an error in the fourth panel: one of the Little Man’s eyes is grey when it should be white. I expect that Collier’s introduced the error in the printing process — Johnson was a perfectionist, and would certainly have noticed such a mistake (had it existed at an earlier stage). An inkblot in the fourth panel slightly mars it. (No, his mouth hasn’t suddenly run to the side of his face — that’s just a blot. Look closely, and you’ll see the Little Man’s mouth intersect with the tip of the spoon). Despite that printing flaw, the strip demonstrates Johnson’s understanding of how faces tell a story. 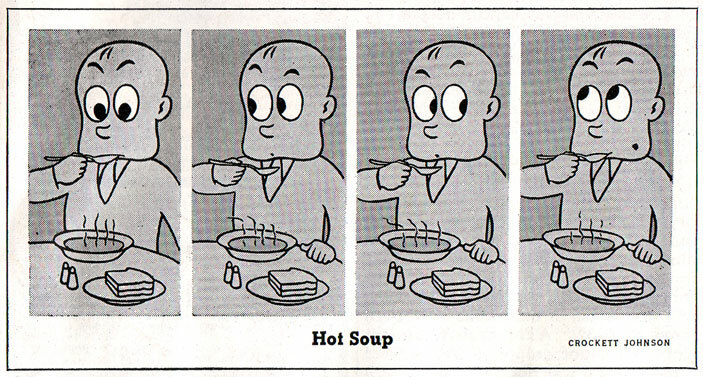 Crockett Johnson’s first comic strip. 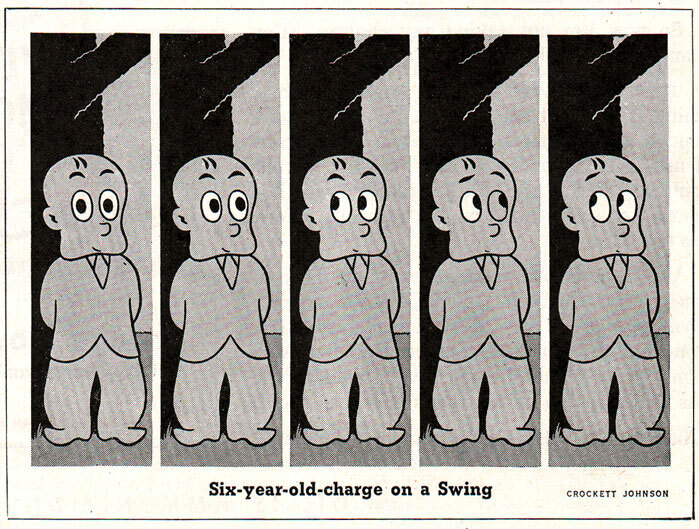 More Little Man with the Eyes cartoons.